Woodward Gallery to present Andy Warhol: Diamond Dust & Shadows, the complete 1979 diamond dust edition. A special, historical exhibition of Warhol’s entire diamond dust Shadow print series from 5 January through 23 February. In the beginning of his career, Andy Warhol moved away from the abstract art of the time to create art from images of popular culture. 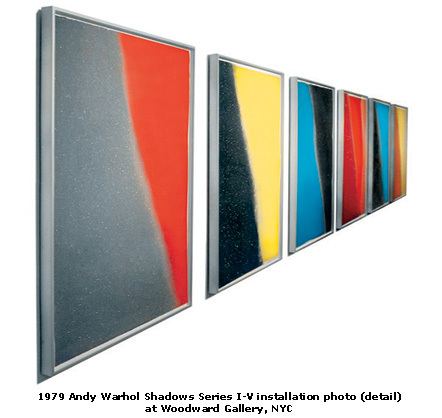 Ironically, in the final decade of his life, Warhol became preoccupied by abstractions. Warhol used these shadow images to develop a silkscreen print series designated in five parts. There are twenty-two prints which comprise one complete Shadow series. Each 43 x 30 1/2 inch screen-print is unique in color and degree of diamond dust application. Each part of the Shadow series I-V was produced in small editions that were numbered and signed. Warhol also completed paintings of this subject. My buddy normally recommended this webpage however this is the very first blog page I’ve gone through to date. I am very content and at this point a admirer.